Now, I haven’t done a review of last year, it’s not something I’ve done before so not really sure of the benefits. My aim remains the same, to ensure those on a gluten free diet, by choice or by design can access a variety of bakes relatively easily. That they can see that having coeliac disease means not having to be different and baking and then the eating, can be enjoyed by everyone. Bakes don’t have to be widely different and that adapting recipes is possible. We have found that Noah will eat well as long as everyone else around him is eating the same. The difficulty comes when he stands out, when he becomes different and the choices he has are limited. Companies can learn a lot by this. Children don’t usually want to be different in their early years, they don’t want to stand out, they want to be equal. Generally, children’s menus when eating out with coeliac disease, are not putting children on the same level. Small changes to ingredients and some thinking around menu design can and will, make all the difference. My experience as a chef currently means that eating out, and trusting establishments, is something we don’t do. There are exceptions, yes, but they are still few and far between. That said then with baking, it is also about me trying something different. But does different mean being obscure? 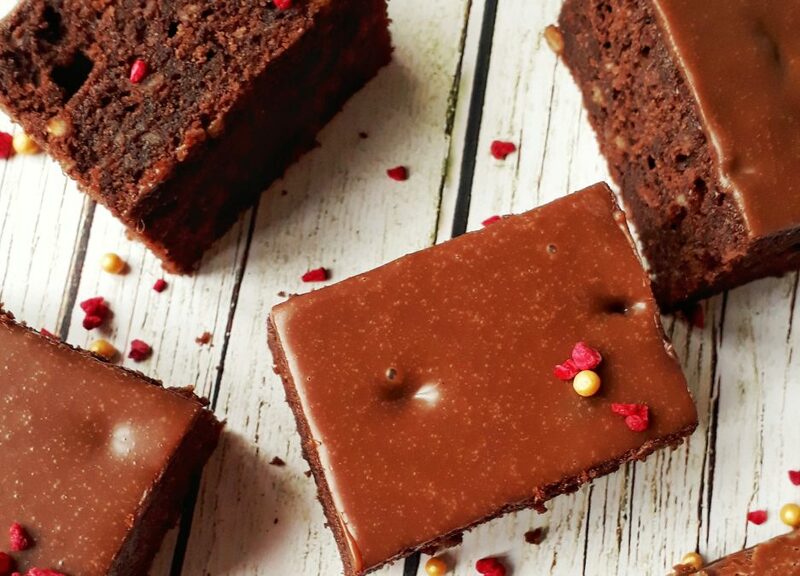 This gluten free cake is wonderfully moist with the flavours all pulling together with each bite. Preheat the oven to gas 4, 170c, 150c fan and line the base of a deep 8″ sandwich tin with greaseproof. Firstly weigh 40g of the nuts and crush them slightly and 100g of the caster sugar. Put this into a saucepan to create a macadamia praline. Stir in 4 tablespoons of water and bring to a boil and then heat until you have caramelised the nuts. This should take around 5 – 6 minutes. Pour the praline onto a piece of greaseproof to cool and to use later as a garnish to the finished cake. If you leave the nuts whole, when blended the oil from the nuts will make the praline soggy. Tasty, but soggy. For the cake then take the 150g gluten free flour and the 60g of nuts and blend these together to form more of a ground ‘nut flour’. Blended, or grounding, the macadamia nuts on their own will just create a soggy unworkable ‘mush’. By adding the flour, it helps to soak up the oil from the nuts. If the nuts are not ground enough, blitz for another minute or more. Once you have your ground flour mix, place this the eggs, sugar, oil, melted butter, essence and sour cream all into the mixing bowl (I used a table top, stand mixer) and beat well for, again, 5 – 6 minutes until you have a light fluffy batter. Pour into the cakes tin and bake for around 45 – 50 minutes. Check with an inserted skewer to see if its done, if it comes out clean it is. If not, pop back in for another 5 minutes or so. Once baked remove from the oven, allow to cool, before then removing from the tin and leave to cool completely before icing. Once cooled down, carefully slice the cake into 3 slices, spread with jam and place the cake slices back to form the cake. To make the praline crumbs, just place all the set, caramelised nuts into a blender and blend to a crumb. To make the icing beat the butter until its light and fluffy, stir in the icing sugar and beat again, pour in the melted white chocolate and beat again until well combined. I seem to be getting through my list of bakes to convert to gluten free. There was the chocolate mini rolls last year, thanks to the new series of The Great British Bake Off. This is a 2 part bake, so line a small cake tin (26x16x3cm) with greaseproof paper and Preheat the oven to Gas 4, 180c, 160c fan. Beat the butter and sugar until, light and fluffy. Sieve the two flours together onto the butter and mix until fully combined and bring together to form a dough. Now this is a small amount of shortbread and I found it easier to roll this out, to the size of the tin, but placing the dough onto the greaseproof, covering with cling film and the rolling out to fit the size of the tin. Remove the cling film before baking, then bake the shortbread for 10 minutes. Remove from the oven and cool completely before spreading the jam. Once you have spread your jam, beat the butter and the sugar until light and fluffy, beat in the eggs one at a time, mix in the almonds, oats, rice flour and essence, then stir in the dried fruit and glacé cherries. Pour onto the jam, shortbread and bake for 25 – 30 minutes. There should be a light bronzed top. Allow to completely cool in the tin before removing and slicing – as 9 big slices or 18 bite size pieces. This recipe and bake is loosely based around a Nigella Lawson recipe for Easy Almond Cake, but I have adapted it for gluten free and a couple of additions and different methodology. Mainly because I couldn’t be bothered to get the food processor out. So I made this in the Kitchen Aid food mixer. You’ll need a deep, lined 8” cake tin with a loose base or you can use a springform cake tin. Preheat the oven to gas 4, 180c, 160c fan. 220g soft Marzipan – can be microwaved for about 10 seconds if required. I used a mixture of Hotel Chocolat and Niederegger Marzipan. And yes these are chocolate coated, it just adds to the taste. And yes, we had a lot of Marzipan for Christmas 😀😀 there was also a chunk of ready to use Marzipan left in a tub too. Beat the marzipan and the butter in the mixer until soft mushed. Beat in the eggs one at a time then pour in the essence. Don’t forget to scrape the sides of he mixing bowl. Tip in the flour and baking powder and stir in until fully combined. Place the cake mix into the prepared cake tin, sprinkle on the toasted nibbled almonds and bake for 40 – 50 minutes. Check with an inserted skewer. If it comes out clean it’s done. Allow to cool in the tin before removing and cooling on a rack. Make the water icing by adding hot water to the icing sugar a tablespoon at a time until you have a smooth paste. Then using a spoon drizzle on the icing sugar and decorate with chocolate marzipan (and or glacé cherries of you have them).